7 Les Houches Number theory, or arithmetic, sometimes referred to as the queen of mathematics, is often considered as the purest branch of mathematics. It also has the false repu- tation of being without any application to other areas of knowledge. Nevertheless, throughout their history, physical and natural sciences have experienced numerous unexpected relationships to number theory. 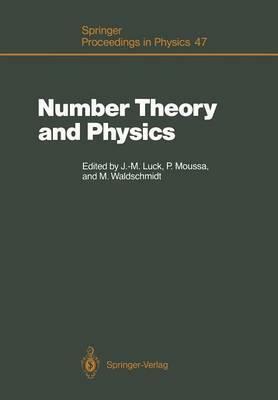 The book entitled Number Theory in Science and Communication, by M.R. Schroeder (Springer Series in Information Sciences, Vol. 7, 1984) provides plenty of examples of cross-fertilization between number theory and a large variety of scientific topics. The most recent developments of theoretical physics have involved more and more questions related to number theory, and in an increasingly direct way. This new trend is especially visible in two broad families of physical problems. The first class, dynamical systems and quasiperiodicity, includes classical and quantum chaos, the stability of orbits in dynamical systems, K.A.M. theory, and problems with "small denominators", as well as the study of incommensurate structures, aperiodic tilings, and quasicrystals. The second class, which includes the string theory of fundamental interactions, completely integrable models, and conformally invariant two-dimensional field theories, seems to involve modular forms and p- adic numbers in a remarkable way. Illustrations note XIII, 311 p.
I Conformally Invariant Field Theories, Integrability, Quantum Groups.- Z/NZ Conformal Field Theories.- Affine Characters and Modular Transformations.- Conformal Field Theory on a Riemann Surface.- Modular Invariance of Field Theories and String Compactifications.- Yang-Baxter Algebras and Quantum Groups.- Representations of Uq sl(2) for q a Root of Unity.- II Quasicrystals and Related Geometrical Structures.- Some Quasiperiodic Tilings as Modulated Lattices.- Types of Order and Diffraction Spectra for Tilings of the Line.- A Topological Constraint on the Atomic Structure of Quasicrystals.- From Approximants to Quasicrystals: A Non-standard Approach.- The Topological Structure of Grain Boundaries.- Calculation of 6D Atomic Surfaces from a Given Approximant Crystalline Structure Using Approximate Icosahedral Periodic Tilings.- III Spectral Problems, Automata and Substitutions.- Spectral Properties of Schroedinger's Operator with a Thue-Morse Potential.- On the Non-commutative Torus of Real Dimension Two.- Topological Invariants Associated with Quasi-Periodic Quantum Hamiltonians.- Spectra of Some Almost Periodic Operators.- The Quantum Hall Effect and the Schroedinger Equation with Competing Periods.- Finite Automata in 1-D and 2-D Physics.- Summation Formulae for Substitutions on a Finite Alphabet.- The Inhomogeneous Ising Chain and Paperfolding.- IV Dynamical and Stochastic Systems.- A Nonlinear Evolution with Travelling Waves.- Iterating Random Maps and Applications.- Hannay Angles and Classical Perturbation Theory.- Nekhoroshev Stability Estimates for Symplectic Maps and Physical Applications.- p-adic Dynamical Systems.- V Further Arithmetical Problems, and Their Relationship to Physics.- Dirichlet Series Associated with a Polynomial.- Some Remarks on Random Number Generators.- Bounds for Non-blocking Switch Networks.- The Ising Model and the Diophantine Moment Problem.- Statistical Theory of Numbers.- Algebraic Number Theory and Hamiltonian Chaos.- Semiclassical Properties of the Cat Maps.- Index of Contributors.